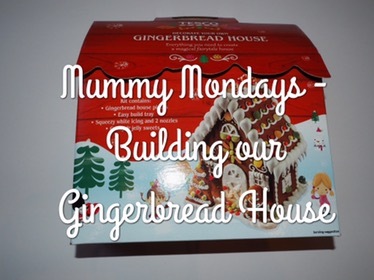 I’ve been so excited to build our gingerbread house ever since I bought the kit in Tescos weeks ago. I knew the reality might not be as I had been dreaming off as putting together a house made of gingerbread with only icing as glue is pretty stressful but we had a lovely time and I’m fairly impressed with the result (although really Ed did all the hard work). The kit we used is from Tescos and was priced at £4 when I bought it on special offer (I believe it is usually priced at £5). It included everything we needed – the gingerbread, icing and sweets of decorate and was fairly straightforward to put together, although there was a lot of icing involved and it did take awhile! The kids really enjoyed getting involved and loved decorating their own sections. Another successful festive activity!